As a parent, you probably had goals for your daughter when she was little—or at least milestones you wanted her to achieve, whether it was simply learning to sit up on her own, stay with a sitter without fussing, or be able to sit still through an entire book without squirming away. Now that she’s older, it’s important for her to learn to set and achieve her own goals as opposed to yours. That doesn’t mean she doesn’t need you—she just needs you in a different way. 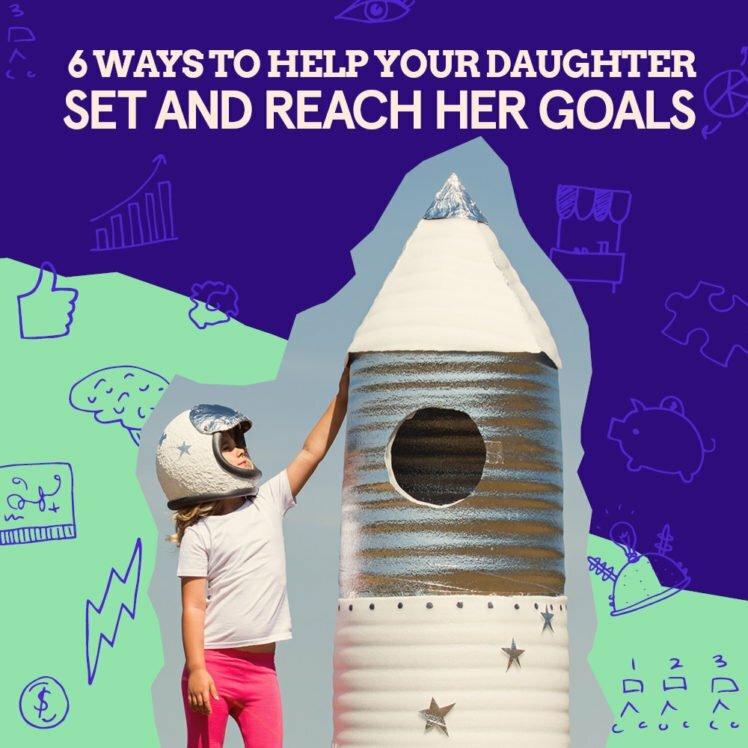 Helping your daughter set realistic goals and take steps to achieve them is an important skill to pass on, and it’ll benefit her both personally and professionally for the rest of her life. The beginning of a new year is a great time to start! Ready? Here are six ways to get her going. First, define what a realistic goal is. If you ask your daughter, what’s one of your goals for 2019 and she says, “I want to play in a youth symphony,” but she’s never picked up an instrument, then it’s a good time to talk about taking incremental steps to get where you want to go. One mistake even adults make is setting the bar too high, then feeling frustrated when they fail. Teach your daughter now the importance of setting smaller, realistic goals and how they are like stepping stones that can get her to a bigger, more far-reaching goal. Kids tend to be general when they talk about their goals. “I want to be the best volleyball player on my team.” Or, “I want to have the best lemonade stand in the neighborhood.” Help your daughter define what steps she needs to take to get there. What measurable actions will help make her the best player? What defines the “best” lemonade stand for your young entrepreneur? If you can help her be more specific, she’ll be more motivated to pursue her goals because she’ll know exactly what she needs to do to be successful. And in fact, sometimes she can use one of her goals to help achieve another—for example, a lucrative lemonade stand can mean pitching in to help pay for a summer volleyball camp. Set up checkpoints to track progress. Maybe the two of you create a poster with tasks to check off each week. Or you put a white board on the fridge. Maybe you use a spreadsheet. Or a particular app that allows her to track specific tasks or accomplishments. Teach her the value of accountability and how measuring progress and checking in along the way can keep her on the right course to reach her goals. Make course corrections, if necessary. Of course, even if the two of you plot out all the steps to help your daughter reach her goals, sometimes life slips in through the backdoor and derails the best laid plans. If she has an athletic goal, an injury may occur. If she has an academic goal, she may encounter a few unexpected struggles in a particular class. If she has a business goal, sales may fall short due to lack of demand. Teach her the value of being flexible and willing to adapt or change her goals if things aren’t going according to the original plan. Accept (and even welcome) failure. And, of course, sometimes, getting to the finish line just isn’t going to happen—for whatever reason. Some goals simply go unmet, whether due to circumstances beyond our control or other unpredictable factors, and if this happens to your daughter, you have a huge teaching opportunity on your hands. Failure is not necessarily a negative! It happens to everyone, and when we handle it right, it makes us resilient, stronger, more determined, and ultimately wiser for the next time. “Think about what you could have done differently. Pick yourself up, dust yourself off, and get back out there with a new goal.” That’s what we’d say to your daughter. The road to success is littered with all kinds of moments like this, and they can be some of the most memorable and impactful. Have an end game in mind. Once she reaches a goal, how will you celebrate her achievement? Will you reward her, will she reward herself—or will simply accomplishing the goal be enough of a reward? Help her picture what success looks like and how you’ll celebrate once she crosses that finish line. This will keep her eye on the prize, so to speak, and provide motivation when she feels like quitting or wants to give up. Of course, all this goal-setting (and achieving) will teach her a lot about the business world along the way. About how goals give companies something to aim for and milestones to hit on their way to becoming successful. About how they rally everyone around a single purpose and move teams in a common direction. And about how they’re necessary for actually getting things done. Goals are like deadlines: If they didn’t exist, there would be nothing to aim for, and therefore less impetus in the world to accomplish and grow beyond the status quo. Whatever path or passion your daughter follows in life, learning how to set and achieve goals will make her journey all the more satisfying and rewarding.